Home » The FabBlog » Throw an Open-Data party! 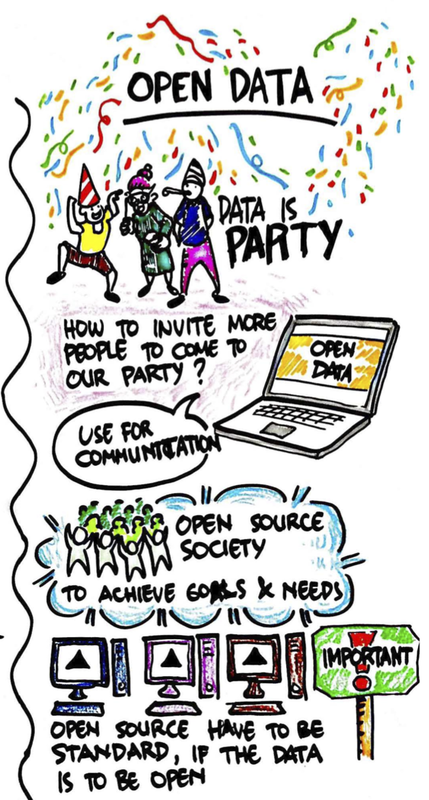 During a training session I recently did in Jakarta for SEATTI – the South East Asian Transparency and Technology Initiative, I had a lot of fun working with the participants on using a party metaphor to talk about open-data. Transparency and accountability advocates often struggle with how to engage citizens in open-data projects. The problem is that data conjures up images of cold spreadsheets full of numbers and when we’re talking about engaging citizens around it it seems really dry. The trick is to get creative – so instead of inviting people to participate in a dry open-data project, think about inviting people to an open-data PARTY. How are you going to invite people to your party and what is going to engage them and make them want to participate? To prep for your party, make sure you’ve got clear goals in mind. What will you ask people to do with the data you are providing. How will it change or impact their lives? If you are asking people to help you gather data, how will the data they are benefiting from their own efforts? Create a really clear invitation to the party. Explain what the party is for, how they will benefit in attending and really clear instructions on how to contribute to the party. Be creative in your wording. Understand what your party participants will want and like – what will interest them, what will compel them to participate? If you are using data to run a campaign, make sure you share your progress. Let them know how participating will help you reach your goal. Keep the party going by keeping everyone abreast of you developments. Give progress reports as you put the data to use. Make sure that participants can see immediate impact. Make it clear how they are contributing to the party and making it better. Spread the party wide by making the data available to everyone! For data to be truly open, it has to be accessible and available to others. If you want people to be able to pick it up and use it, make sure you standardise the data. Share your party materials widely and get other people to throw similar parties and contribute to the data. Open source tools will allow portability and make it easy for you to share. Be inclusive to get good attendance – make sure that you use multiple ways to invite people to participate. So if you are doing data collection think about how people can get you data. Can they use the web, mobiles and paper survey’s to do data collection. Don’t let connectivity be a barrier. When you succeed, really have a proper party and invite everyone to share in celebrating your success.